New Belgium has great beer. Their flagship beer, Fat Tire, is a solid, balanced beer. One of the best things about the brewery is they take chances, like their Lips of Faith line of specialty brews. At their size and popularity it would be easy for them to just push out their regular beers and be content, but they don’t. Plus, their commercials feature the music of Devendra Banhart. 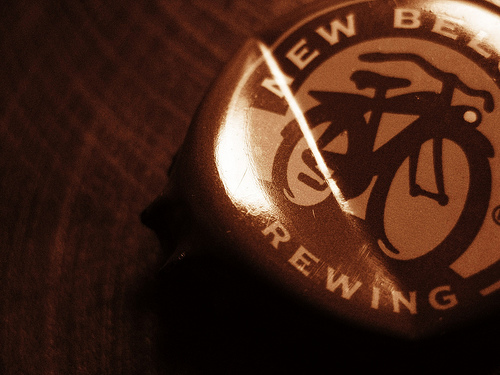 New Belgium is a great success story and a truly bright spot for American beer makers and the brewing industry. Now that I have said that about the actual brewery, a place we visited on the first beer tour, let’s discuss the tasting at Barley’s. This was actually the first time either Nate or I had been to Barley’s. 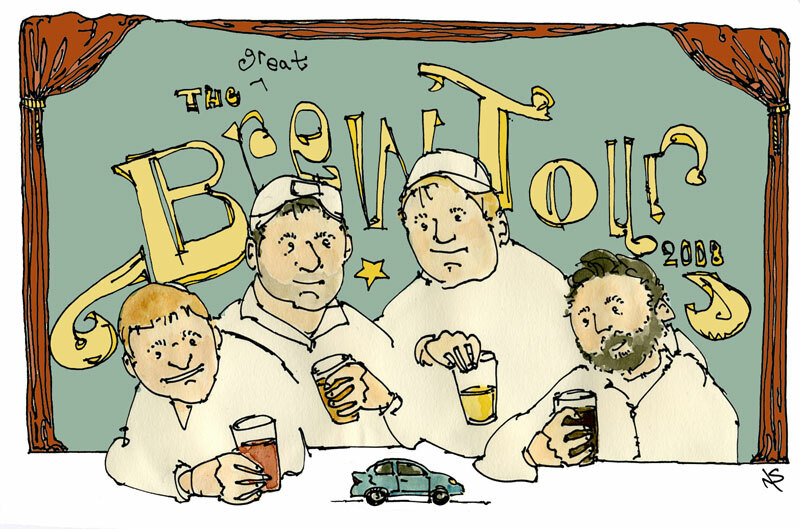 We drive by the Shawnee location all the time on I-435, but never have been in the area to drink. Barley’s is top notch. Their tap row is not intimidating, but visually and mentally intoxicating. If you engage with it, you will become physically intoxicated as well. So Barley’s has that going for them. I could spend a lot more time on Barley’s and I will, but I was impressed. Very impressed. The event cost $16 for their non-members (Barley’s calls it the “Mug Club”). The price was reasonable considering they were providing food along with the beer. Based on the opening words from Barley’s manager the turnout was higher than expected. The event was a sellout, I would estimate about 50 people were in attendance. We sampled five beers. All of them came with a brief story and description of the beer and all the other things that go on during a tasting. I was expecting to taste the whole Lips of Faith line, but unfortunately that was not the case. Maybe I didn’t read the e-mail close enough talking about the tasting or what, but I was stoked to try them all, but we only had two from the line. Fat Tire This was the first beer of the night and it is just a great balanced beer. We kind of got lost on the way, I-435 had a wreck on it so we tried the back roads without knowing the street and town or general area Barley’s was located. Not to knock Fat Tire, but when we finally had some beer, anything would have tasted great. Abbey This was the second beer of the night. The host or “Beer Ranger” as New Belgium calls them, made an interesting comment about this beer. 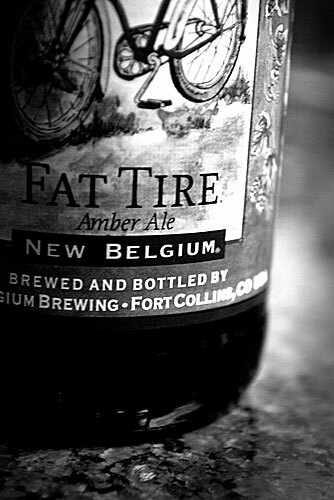 It was what New Belgium wanted as their flagship beer but Fat Tire was the one that won the hearts of the drinkers. Oh, it also didn’t help this beer is their lowest selling. However, it is their most decorated beer in terms of awards. La Folie (A Lips of Faith Beer) Wow. This beer took me completely off guard. It is a Belgium sour and a complex beer that tastes closer to champagne than Fat Tire. There really is a lot going on here, unfortunately after the initial shock of this beer wore off, I had finished it. So I’m not comfortable talking too much about it. What I can say is this is an interesting beer. Everyone should try it just to try it. Barley’s paired it with the dish Melissa Newell, Owner of Terroir Restaurant, recommended on New Belgium’s site. It worked perfectly with it. Mighty Arrow Pale Ale This is New Belgium’s first Pale Ale, according to the Beer Ranger. The Mighty Arrow did not disappoint. For a Pale Ale it has a good balance between the malts and the hops. Dunkelweiss 30° (Lips of Faith) Another interesting beer in regards to the flavor. This isn’t a beer to just drink by itself, it needs to have food with it, preferably dessert. And that idea alone—drinking beer with dessert—opens a whole new area of beer enjoyment. It is a place where these fruity, full bodied beers can be enjoyed, even if you are not a fan of them.